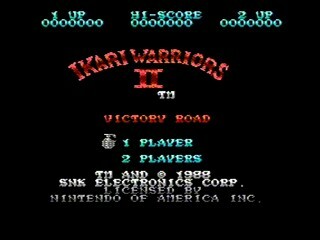 Released in 1986 for Arcades and later for NES, Amiga and ZX Spectrum by SNK Playmore, Ikari Warriors 2 is the sequel to Ikari Warriors 1, a top-down shooter with some interesting character/place name choices. The antagonist is called Zang Zip, for example. What. Best Time: 0:07:58 by 'ktwo' on 2014-11-14. There isn't a lot to comment on in this run that's not mentioned in the sdakb. This is easily the cleanest speedrun I have made (but also maybe the easiest to execute). There are basically no "mistakes" in this run. A few frames could be saved by faster strats I'm aware of (described in the sdakb), being pixel-perfect in all the turns or faster menuing. I'd be surprised if more than a second was lost in total though. Compared to the videos in the sdakb, I took some unintentional damage (the ones in level 2 and 5) and missed hitting a few enemies (potentially resulting in addtional lag), but nothing of that ended up costing any time. /br> As a sort of easter egg, I left the intro running after the credits. I usually don't do that, but the intro is pretty funny (typed out in morse, so ultra slow in this ultra slow game, and the plot has also to be one of worst). - Master-88 for his initial work on this title. While there aren't many (non-obvious) strats left in this run from his run, it was a good baseline when starting to speedrun this game. I should also mention that without Master-88's run, during which I got a bit involved with the routing, I would not have picked this game up myself.